At least 270,000 people have fled their homes in south-western Syria since the military launched an assault on rebel-held areas two weeks ago, the UN says. But neither country has said it will allow an influx of refugees, sparking fears of a humanitarian crisis. Over the weekend, more than a dozen towns and villages reportedly agreed to surrender and accept President Bashar al-Assad's rule. UN officials said on Monday that more than a third of the population living in rebel-held south-western Syria had fled their homes in response to the government's intense air, artillery and rocket strikes as well as clashes on the ground. Up to 70,000 of the displaced are reportedly gathered near the closed Nassib border crossing with Jordan, where many families are being forced to live in makeshift shelters or out in the open, without basic supplies. The high number of displaced people has also increased the pressure on hospitals in border communities, which medics say have been repeatedly targeted by Syrian government and Russian air strikes since the government offensive began. UN High Commissioner for Human Rights Zeid Raad Al Hussein has warned of a humanitarian catastrophe in Deraa and urged neighbouring countries to provide safe passage to those wishing to flee the violence. Jordan has kept its border closed and said it could not cope with taking in any more than the 660,000 registered refugees it already hosts, while Israel has said it will not allow Syrians to cross into its territory. After meeting UN officials on Monday, Jordan's Foreign Minister Ayman Safadi said it had been delivering aid to crossings with Syria, but that there had been issues getting permission from Damascus to transport it over the border. "We believe that it is in nobody's interest to have Syrians depart their country," he said. "There is no shortage of [aid] supplies. The question is just to get it across." Mr Safadi also said he would hold talks with his Russian counterpart in Moscow on Tuesday, which he hoped would "take us more steps forward to contain this crisis and prevent more destruction". Russia has opened negotiations with rebel factions on a wider ceasefire deal on behalf of the government. 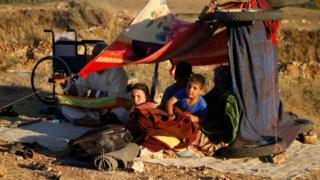 But several rebel commanders have rejected a proposal that they lay down their arms in return for guarantees of safety. The Israeli military has also stepped up its humanitarian efforts. On Friday, it took in six injured Syrians, including four young children, for emergency medical treatment. It also supplied tents, food, baby formula, medical equipment, clothing and shoes to camps in the Golan Heights demilitarised zone. "We will continue to defend our borders. We will extend humanitarian assistance to the extent of our abilities. We will not allow entry into our territory," Israeli Prime Minister Benjamin Netanyahu told a cabinet meeting on Sunday.